Yesterday Amata and I made our first trip of the season to the Chirstkindlmarkt at Daley Plaza and Block 37 (whatever the number, the empty lot across from Marshall Fields). Now that we have moved to the country out at Western and Taylor and no longer live just down a little ways on Dearborn in Printers' Row, such visits to the market require a bit more planning and effort than they formerly did, but they remain nonetheless highly rewarding. Yes, many of the craft-booths are quite nice (though we did not see the purveyor of wooden toys this year; perhaps he's now on Block 37) and I intend to return to buy a Stollen and a few Christmas ornaments. But the real point of all this is the street food. 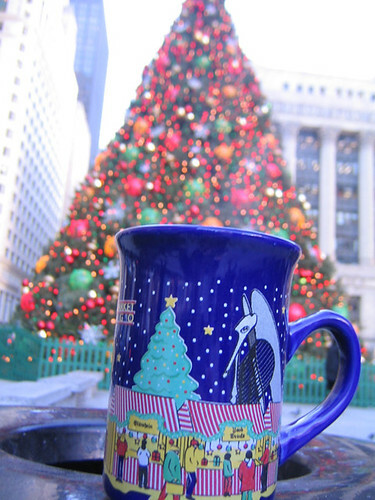 We usually visit the little stand on the edge of Daley Plaza facing Dearborn Street. 4) Bratkartoffeln (German fried potatoes with onion, bacon and caraway: but as I warned in my Bratkartoffeln post in Shopping and Cooking, do not get these at hours of peak business, for they cannot cook the potatoes quickly enough to keep up with demand and one typically, as we did yesterday, receives beautifully seasoned but undercooked Kartoffelscheiben). 5) Kartoffelklösse (potato pancakes, two styles, with apple sauce or sour cream). Klassisch und köstlich. ('classic and delicious'). N.b. : These are not available from the aforementioned Imbißbude but from one further inside of the plaza, facing City Hall. 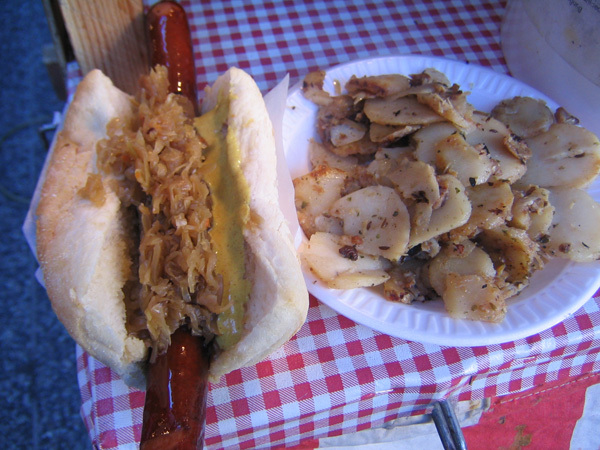 Items 1-3 are properly consumed mit Sauerkraut and the very good German mustard offered at the counters. Other comestibles are offered (goulasch soup, schnitzel sandwiches, pretzels, usw. usw.) but in however many years the market has been here, with multiple visits per year, we've never gotten past the basics listed above. Last edited by Antonius on April 12th, 2005, 9:58 am, edited 1 time in total. I'm drooling already from your description of what's on offer. What is the exact address (cross streets, even) of the market, and what are the hours/days these treats are available? By the way, are the Kartoffelkloesse potato pancakes or dumplings? I always saw pancakes as Kartoffelpuffer and Kloesse more like a dumpling. Maybe this is a regional variation? Thanks for the descriptions, mein Freund. Guten Appetit! The daley Plaza is the square with the large Picasso sculpture on the the southern half of the block bounded by Dearborn (east)- Clark (west) - Washington (south) - Randolph (north). There's also a large number of market stalls on the empty block just east of that (between Randolph - Washington - Dearborn - State). I don't know the hours but they're certainly open from late morning through the early evening (rush hour time). I definitely mean pancakes but admit that I misleadingly used the term my mom's family used dressed up as Hochdeutsch -- they're a somewhat surprising mix of Alsatian and Prussian. The Alsatian term they use for essentially the flat pancake form is confusingly enough 'Gleese' with unrounding of the umlauted vowel and voicing of the k- to g-). I should have used the more regionally neutral Kartoffelpfannkuchen. Sorry for the provincialism! If you have a chance, check it out; it's good stuff. Me- "Wissen Sie, das sind die beste Kartoffel, die ich in meinem Leben gegessen habe"
90 yr. old Kartoffeloma - "Tscha, yish wess schon..."
My wife, 21-month-old daughter and I are just back from the market and can offer more specifics about the hours. They are open 11am-8pm Sunday-Thursday, and 11am-9 pm on Friday and Saturday. The large beer/wine tent on Block 37 is advertising German bands on Friday and Saturday nights, incidentally. 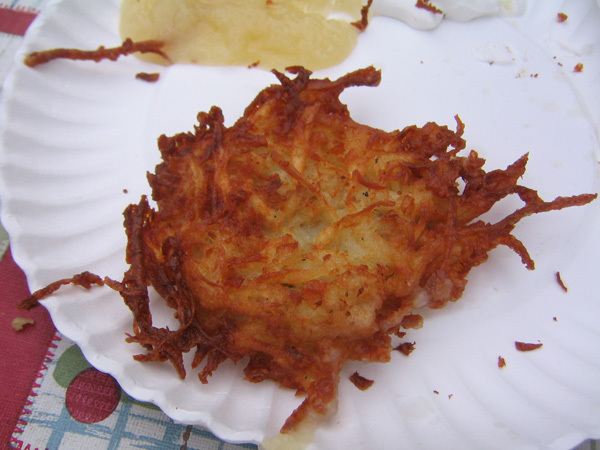 We had made plans for dinner at home, so were only snacking this afternoon, but the potato pancakes (we ordered the German style, with bacon as well as onions, from the vendor on Daley plaza facing city hall) were delicious as advertised. As we tried to navigate through the masses after gnoshing, a chorus of "Mo pancakes" kept rising from the stroller, so I think we will be back soon. I noticed one interesting booth that I don't recall from previous years. On Block 37, near the corner of Washington and State, is a self-proclaimed German/Alsatian baker, actually baking bread on the site in what seem to be portable wood-fired ovens (stacks of wood were very much in evidence). In addition to some lovely looking loaves, they were also advertising Alsatian tarte flambee, which I look forward to trying. I'm glad you wrote this up. Each year I very much enjoy the Bavarian carnival food that these German folks whip up. I'm interested to know just where these humble, but very German (ie, not guest-workers) hawkers hail from. One doesn't see many blond street food vendors in Germany, at least not where I've been. I have heard some of the vendors speaking Polish, but most seem to speak German. The food, and the beer, is really quite good and there is no knocking the "authentitcity." Last year I spoke at some length with one of the pancake vendors who spoke of what a sweet deal the City provides. I'm not sure of the details, but it seems the City has some involvement in bringing these people over and putting them up for the event. Look closely, and it seems that much of the equipment appears to be from the old country. I wonder about the logistics in that regard. I envision a UPS plane loaded down with mobile food carts and hand-carved nutcrackers. You're right; they fly all the specifically German food items in. And they must have a very sweet deal and make money hand over fist, since they're willing to camp out here for a month. Many of the booths indicate where they're from and if memory serves me the majority are from Plauen and the Vogtland (Erzgebirge) or near there, that is, what was the southernmost part of East Germany and maybe the bordering part of Bavaria, over toward the northwestern bit of the Czech Republic. Last edited by Antonius on November 16th, 2005, 7:12 pm, edited 1 time in total. I am kicking myself hard for not visiting this market when I was in the area with The Wife's relations right after Thanksgiving. I saw the market, I listed toward it, and then my sister-in-law said, "hey, let's go inside Field's," at which point I was subjected to a very loud and senseless sound and light show in the central court, which attracted hundreds of shoppers who, with eyes lifted upward toward big blue ornaments, watched fake snow fall. After that, the afternoon was a blur. If only I had known...now, I will make a point of going back (to the market, not Field's). would it be possible that the region of Germany that the vendors come from is the one with the very small native Slavic/German population (whose name escapes me right now)?? I don't have a map in front of me, but the Germanic Slavs --- SORBIANS!!! A-HA!! I believe they are concentrated around Cottbus (Chosebuz in Sorbian). Is this the area you're talking about, or is it further west? Some of the dishes you mentioned could definitely be made with a Slavic or Czech tinge, or even fall under the rubric of Bohemian or Sudeten cuisine. Just wondering. It makes sense that they should want to come and stay and work for a month, even in a somewhat cheesy, touristic, service-industry job. Unemployment in the former DDR is running around 20-25% these days. Ouch. hungryrabbi wrote: would it be possible that the region of Germany that the vendors come from is the one with the very small native Slavic/German population (whose name escapes me right now)?? I don't have a map in front of me, but the Germanic Slavs --- SORBIANS!!! A-HA!! I believe they are concentrated around Cottbus (Chosebuz in Sorbian). Is this the area you're talking about, or is it further west? Not too many folks know about those pesky Sorbians! 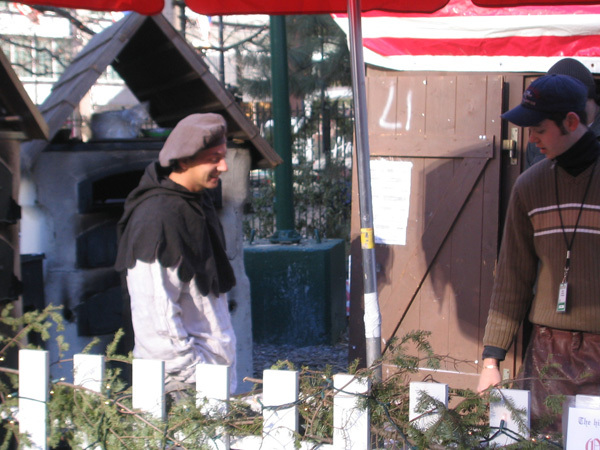 I don't know if there are any of them involved in the Christkindlmarkt but, as I said, a number of the booths say they're from the Vogtland, which is in in the Erzgebirge, which is to say the southern part of what used to be the DDR (nowadays in the BRD State of Sachsen). But I was there again today and, after consuming a Kaßler sandwich and Bratkartoffeln,* I took a stroll, bought a couple of things, and surreptitiously took notes (I felt sort of like some Stasi agent, hiding behind light poles and jotting down notes about the goings-on). The majority are from the Vogtland, several specifically from the 'city' of Plauden but others also from little towns in that part of Sachsen like Schleiz. There are, however, in addition to the Ecuadorian- and Ukrainian- and Estonian- and Illinoisian-run booths, also some from parts of Germany outside of southern Sachsen, including Berlin, Rothenburg ob der Tauber (Bavaria), and Neidenbach (near Bitburg, i.e. near Trier). I had a nice chat with a young woman at a booth with tin-ornaments from Nurnberg who confirmed my belief that most of the vendors were Osties. But Nurnberg is just a short way from Plauen and the heart of the Erzgebirge region. *My lunch took place after 1:30, after the big rush, and my Bratkartoffeln were indeed more thoroughly cooked then they typically are when one orders them after standing in line for a bit. 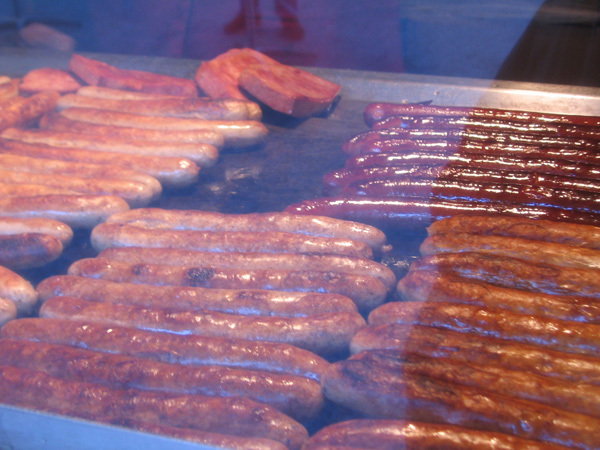 The Kaßler, though, is perhaps better bought at peak times, fresh from the grill. Mine had been sitting, cooling its heels in a bath of meat juice. It was very good but I fear optimal Kaßler and optimal Bratkartoffeln might be very difficult to get at the same time. And did I mention? -- The sauerkraut is very nice. I walked through the market on Saturday with what seemed to be a million others. I will abmit that the food looked outstanding and it was probably the most authentic German food that I have seen in the Midwest. Unfortunately, we had just eaten - although the vealwurst was really hard to pass up. 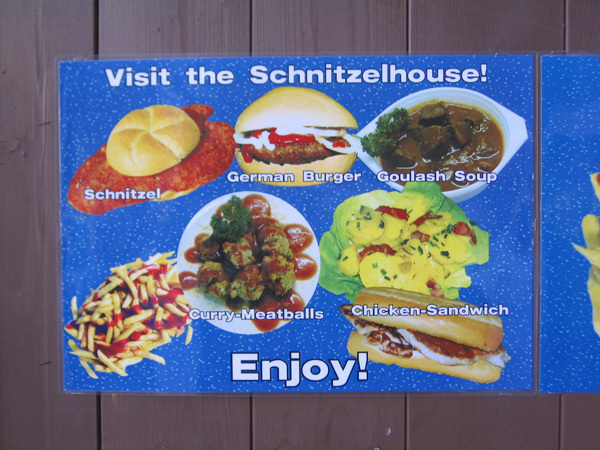 "most authentic German food that I have seen in the Midwest"
That's sort of a provocative statement. Are you saying that more authentic German fare is common elsewhere in the US, not in the Midwest, not in Milwaukee, Chicago, St. Louis, Cleveland (is Cleveland the first city in the Midwest, Pittsburgh the last in the Northeast; I think so) et al? Then where? San Francisco or Manhattan, right? I've long been a fan of the market, but for stocking stuffers and marzipan, not for food. Antonius' post and a court call prompted me to make a 3 p.m. lunch today. Yum. Yum. I had the two sausages with sauerkraut and the good mustard (she asked twice to be sure I wanted the kraut) and the Bratkartoffeln. It was rainy, but I munched my way back to the office, hoping the potatoes wouldn't slip off the little paper plate everytime I angled it toward my mouth to grab a bite of the sausage. We all made it (well, except for the 1.5 sausages that were gone by then) safely. TheBratkartoffeln were perfectly cooked and very very good. The sausages were nicely spiced and neither too greasy nor too dry. Well worth the trip. Thanks for all the tips. Thanks for the heads up. We passed through the Christkindlmarkt last year quite briefly on a very cold evening, and I'm not sure I would have returned based on that experience. This afternoon, I hopped on the el with the two boys for a late lunch (Ann, I surely just missed you). We went through the Block 37 portion, and the food was outstanding--Bratkartoffeln and Kilometerwurst, on your recommendation. I expect to return with Kate this weekend to sample further. Mmmm... I very much enjoyed seeing the goulash prepared in cast iron skillets large enough to fry small children, and with handles several feet long. All in all, a very cool market. forget the glug/gluwein. but hofbrau beer is great but is now $6.50!! down with judge and dolph, aka wirtz. i like the goulash soop near the daley plaza bier tent and the deep-fried potato pancake in the sw corner of blk 37.
luv those toasted, glazed nutz too, arrgh! 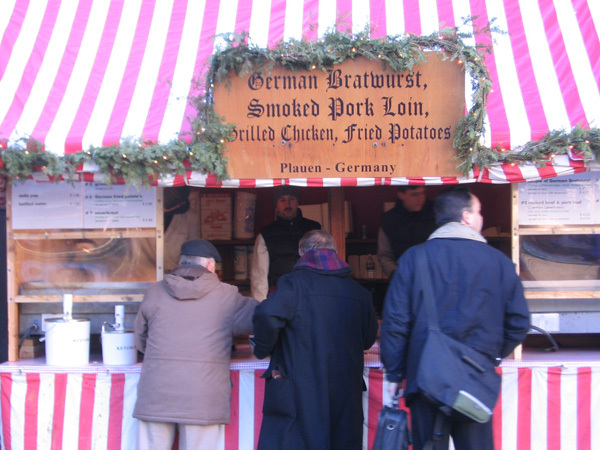 Our son is a big fan of "outside food", which for him means the Christkindlmarkt and Maxwell Street. Two years ago, when he was two, he yelled out "BYE FOOD!" as we started down the steps to the Blue Line. But another thing he really enjoys at the Christkindlmarkt are the toy trains running in the southwest corner of Daley Plaza (where the fountain is during warmer seasons). He gives the big tree a glance, doesn't seem interested in waiting in line to talk to Santa, but boy, he can watch those trains forever. By the way, if it's too chilly to eat your "outside food" outside, there are a few tables set up inside a tent near the Daley Center. Amata wrote: By the way, if it's too chilly to eat your "outside food" outside, there are a few tables set up inside a tent near the Daley Center. I went yesterday in the afternoon. It wasn't crowded at all since it was a little rainy. 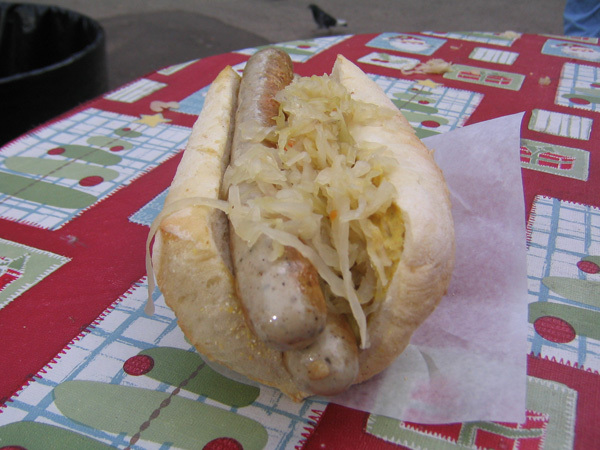 I had a delicious bratwurst with mustard and potato pancakes (2 plain, 1 bacon/onion). I also picked up a Helmut's cherry strudel. I unfortunately paid $2 for a slice of the black forest bread, which wasn't worth it. Also $3 for a tiny styrofoam cup of cider is too much. Yesterday I tried the "Alsatian Flamed Tart" from the people with the wood-burning oven (on Block 37, halfway along Washington). Interesting. They take a piece of their 80% whole wheat, 20% rye bread dough, roll it into a very flat oval about 6 inches long, put a few toppings on it, and wait for your order before sticking it in the oven. I had the traditional version with bacon, sour cream, and onion. There's not much bacon flavor--it was just two very small squares-- so it mostly comes through as a smear of sour cream and lot of still-pretty-raw onion. I like whole wheat bread and I like onion, so I enjoyed it. People who are less fond of onion might prefer their vegetarian version, which includes cheese of some kind. It seemed a bit steep at $4.50, but in fact turned out to be quite filling, thanks mostly to the excellent whole wheat crust. I can also report favorably, and with fewer reservations, on the goulash soup served by the folks on block 37 who also serve the curry meatballs. Lots of very tender meat and a wonderful broth, seasoned mostly I think, with a medium hot paprika. They offer a frequent-buyers card--after five punches your sixth meal is half price. I was tempted, but then thought of all the other food I have yet to try, and took a pass. Thanks for your report on the Alsatian flamed tart/Flammekuche. As I mentioned in one of the above posts, we tend to stick to the same small set of things at the market simply because they're so good, the market is around for just a month and we can only get there a few times each year. But I did stroll through Block 37 the other day while shopping and saw that there are a number of interesting offerings from the booths in that part of the market (I saw someone enjoying the lentil soup and it looked good). It sounds as though the Flammekuche you got wasn't exactly scintillating. This is one of those dishes, like Neapolitan pizza, that relies on simplicity and proper execution and it sounds like they're not doing anything strange, but I wonder if the less than wonderful results have in part to do with the logistics of producing what really are in essence pizzas in that outdoor market setting. The whole wheat crust isn't the norm, I believe, but that sounds like a nice variant to me. Herebelow are some recipes for Flammekuche: one from the US which takes some minor liberties and then some from French and German language sites. - A slightly 'tarted' up version (pun intended) in English can be found here (adds sugar, leaves out nutmeg, and oddly calls for cottage cheese which is texturally not right to my mind). Compare this one to similar simple traditional versions in French and German linked below. - Recette: La flammekuche Alsacienne:ici ou l'. 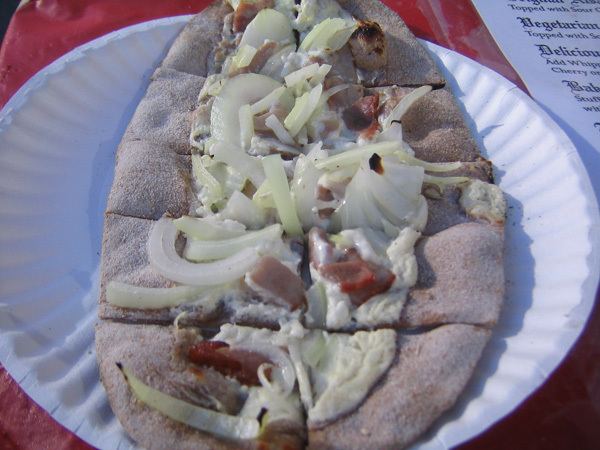 The second link has a description of how one is supposed to eat this 'tart'; it is, indeed, an Alsatian pizza. Antonius wrote: The second link has a description of how one is supposed to eat this 'tart'; it is, indeed, an Alsatian pizza. And, appropriately enough, on Block 37 they're cutting it into Chicago style squares! We had Flammekuche at an Alsatian restaurant in Paris a couple of years ago. It was sensational, and one of the tastiest items we had in France. We thought it essentially pizza with a quiche topping, and when done correctly, it's outstanding. The place we were at not only served savory pies as a main course, but a sweetened fruit covered version for dessert. Original Wagner. Einmal Wagner - immer Wagner. Goofiness and bad marketing know no national boundaries. Wow. I took a look at the "American Big Pizza" stuff. That's not my America. No wonder people dislike us. The Germans are poisoning the well. I'm not as well-traveled as some, but I have lived in America for a few years now. I know "anything goes" here, what with all the multi-culti hip-hop pizza eaters living the Vegas lifestyle and all (as pictured in ad), but I have not seen the tunafish pizza or the pizza with kidney beans and corn before. Das ist cool. So schmeckt. ... but I have not seen the tunafish pizza or the pizza with kidney beans and corn before. Das ist cool. So schmeckt. Did you notice that alongside the Boston and Hawaii and Texas and Western pies, they don't offer a Chicago pie... I guess this town is too square. The Americans are not the only ones taken to task. When you visit their homepage, which Antonius linked to, you have: Cuisine francaise a la Wagner. We are not alone having our cuisine and culture Wagnerized. ... and Italians too, of course... This is, after all, a "pizza" company... Or is that Pfitze? Well, I've been waiting for a sunny day to get back to the Christkindlmarkt and snap some pictures. Actually I've been waiting for a sunny and decently temperatured day, but I settled... Here's my House of Glunz glogg, in its commemorative cup. A little sweet, but warm is good. A lesser man would have considered a Hungarian sausage and a plate of potatoes "lunch," but I knew there was something else I had to have. I crossed over to the Block 37 portion, aka the Mercedes Benz part, and began hunting for the tarte flambee. For a moment I was concerned that they had packed up or something-- then I spotted the woodburning ovens (and the medieval costume) in the far SE corner of the market. The whole wheat (and rye?) crust crisps up beautifully, the creamy sour cream or fromage blanc absorbs a flavor of wood smoke... I scarfed this down in seconds and grabbed everyone I met during the rest of the day to show them my photos. This is one of the best things I've had all year, it's not just authentic to the ones I've had over there, I think it's better than any I can remember. Look at it, longingly and appreciatively, and then say to yourself what Antonius said: this is the item you must eat. It will be there for another week or so. Do not miss it. Last edited by Mike G on September 25th, 2009, 9:29 am, edited 2 times in total. Vielen dank fuer die schoenen Photos. This is the kassler rippchen sandwich, or as they call it, German smoked pork loin. Frankly, this was the first thing I was not wild about (and she wasn't either). 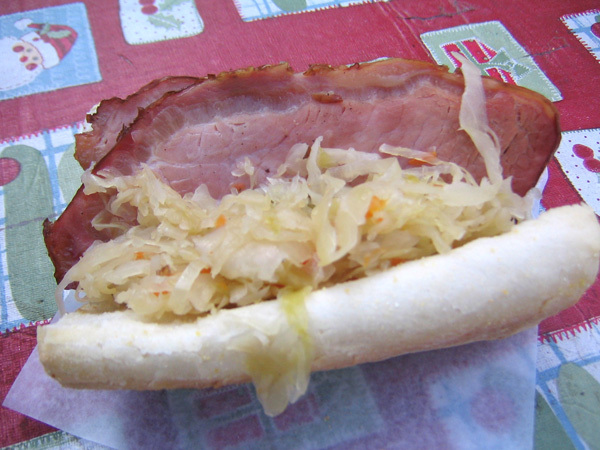 Basically it was just like two thick slices of ham with kraut and mustard, not that smoky tasting. 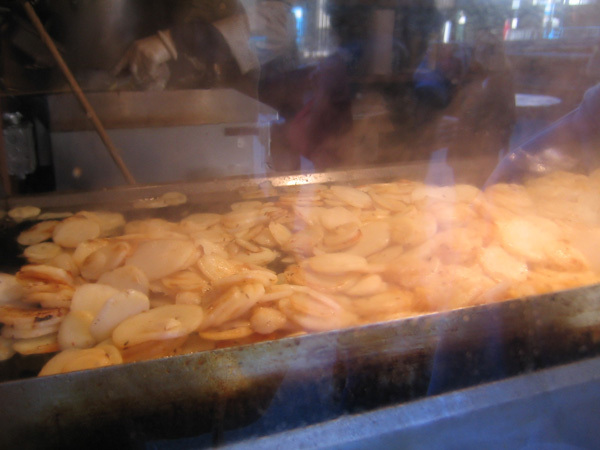 Nothing wrong with that, though maybe it was a little bit dried out on the fryer and would be better a little fresher, but I just wasn't that excited about it and in fact it motivated me to go back and order the brats and give most of the kassler rippchen to a homeless guy. So then I went back and ordered the brat sandwich (you have to get two brats, maybe because of the size of the Gonnella or whatever roll they serve them on). What's there to say? As Antonius said, simple, genuine, very yummy. Given that the brat is hardly unknown in these parts, however, I'd still give the nod to yesterday's Hungarian sausage (kilometerwurst) if you're only going once. I was tempted to try the bratkartoffeln from a small stand frying up things in giant skillets, but decided to try the potato pancakes instead (though it wasn't too much of an experiment since I had had them in years past, when I worked in the Loop). I like more onion flavor in a potato pancake but nothing wrong with these at all. Still, again, I'd give the nod to the bratkartoffeln if you're only going once, as they are more uncommon and to my mind a richer, more interesting dish. Last edited by Mike G on September 25th, 2009, 9:36 am, edited 1 time in total.